Career connected learning, weaves together school-based learning, extended learning, and work-based learning. More learning experiences in and out of classrooms prepare students for life. Do you remember what experience helped you decide your dream career? Were you in first grade? Sixth grade? High school? In Everett Public Schools students explore potential careers in different ways during their K-12 experience to help unlock their awareness of and interest in career opportunities. 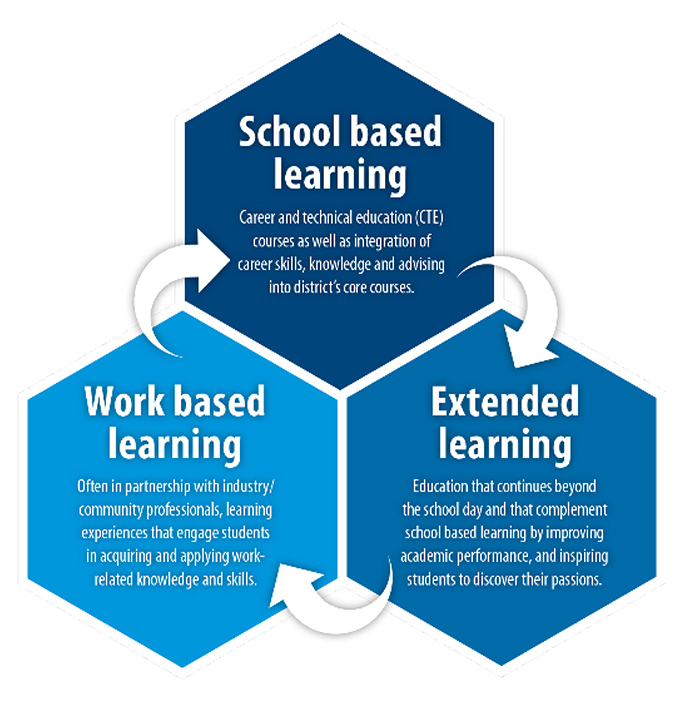 This approach, called career connected learning, weaves together school-based learning, extended learning, and work-based learning. As early as kindergarten students can experience school-based career learning by way of guest speakers as well as project/problem based learning. Beginning in middle school, students can take career and technical education (CTE) courses, which emphasize academics as well as real-world and real-life skills. Extended learning experiences such as robotics and Career Technical Student Organizations are examples of education that extends beyond the school day, complementing school-based learning by improving academic performance and inspiring students to discover their passions. Through strengthening its partnerships with local business, industry, government, and nonprofit and post-high school education and training organizations, the district will increase and enhance career connected learning opportunities that emphasize regionally high-demand and high/middle skill career opportunities. District Executive Director Dana Riley Black shared that our career connected learning efforts are, “aligning industry needs with student opportunity.” This will include further developing six high school career pathways, developed through data-driven research and consulting with regional experts. The six pathways, Aerospace and Advanced Manufacturing, Business and Professional Services, Education, Energy and Sustainability, Information and Communication Technology, and Medical and Health Careers, represent growing, high-demand careers in our area. In a special meeting May 31, 2018, the school board met with community leaders to explore how to expand career connected learning efforts and opportunities for students. Core to the discussion was strategies for establishing business partnerships. If you or your business would like to partner with Everett Public Schools and its career connected learning efforts, please consider an employer engagement opportunity.